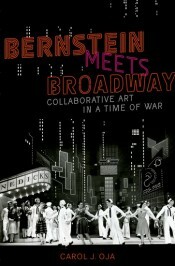 In this blog post, Carol J. Ola, author of Bernstein Meets Broadway: Collaborative Art in a Time of War, discusses how Leonard Bernstein and the creative artists of the musical On the Town used their hiring decisions to challenge racial performance practices of the day. On the Town opened on Broadway in December of 1944 towards the end of World War II, and marked the debut of a dazzling group of creative artists: the composer Leonard Bernstein, the lyricists Betty Comden and Adolph Green, and the choreographer Jerome Robbins. All were the children of Jewish immigrants. Balancing left-leaning personal politics with the pressure of launching their first show, this team of twenty-somethings made a number of hiring decisions that boldly challenged racial performance practices of the day. Exploring those progressive choices opens a perspective on the racial climate for performers of the day. One daring step was to feature the Japanese-American dancer Sono Osato in the starring role of Ivy Smith, a character shaped as an “All-American Girl,” while the United States was at war with Japan, internment camps established on the West Coast and Southwest, and government propaganda aggressively targeting the Japanese. Like thousands of Japanese nationals, the US government detained Osato’s father, Shoji, immediately after Pearl Harbor, and he remained on parole in Chicago for most of the war. As a result, he could not attend his daughter’s opening night on Broadway. Declassified FBI files tell the story of Shoji’s imprisonment and persecution, revealing no justification for the treatment he received. 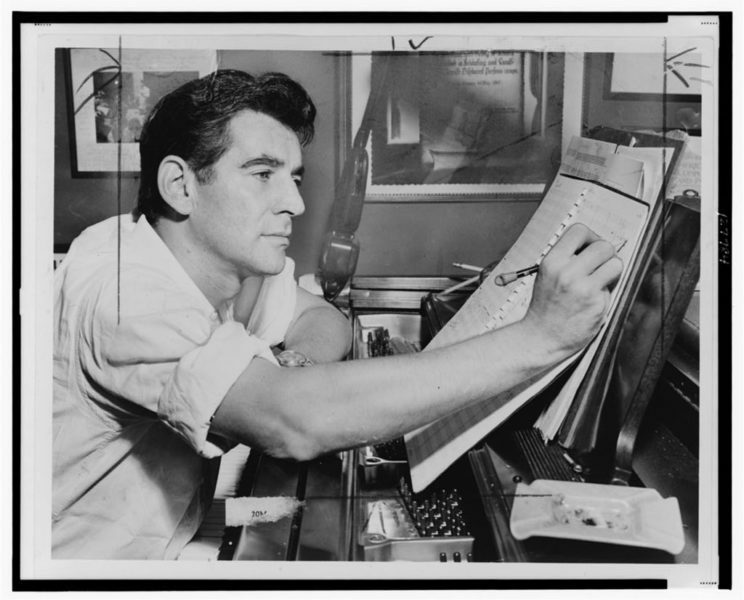 Image credit: “Leonard Bernstein making annotations to musical score” by Al Ravenna. Public domain via Library of Congress. As a result, On the Town—a show about three American sailors on a one-day leave in New York City—flirted with what was then called miscegenation. The pursuit of Ivy by one of those sailors — Gabey (played by Cris Alexander, an actor of Caucasian heritage) — was the central premise of the show. A promotional photo, now housed in clipping files at the New York Public Library at Lincoln Center, shows Osato standing seductively over Alexander, giving a sense of how brazenly their relationship was portrayed. Equally audacious were staging decisions related to African Americans in the cast. On opening night, there were 6 blacks out of a cast of 56. By today’s standards, that number appears as tokenism. Yet these black performers directly challenged racial stereotypes of the day. On the Town eschewed blackface, steering clear of bandanas, maids, and butlers. It did not segregate the black performers on stage, as was often the case, but rather it modeled an integrated citizenry. Black dancers in sailor costumes stood comfortably alongside their white comrades, and there was mixed-race dancing, some of which required training in ballet. These staging decisions modeled a vision of urban interracial fellowship. They imagined an alternative to the segregated US military of World War II, and they offered an early case of what has become known as color-blind casting. The Times Square Ballet, which closed Act I (pictured here), was one of the principal showcases for these progressive racial statements. In yet another gesture towards civil rights, Everett Lee took over the podium of On the Town, becoming one of the first African Americans to conduct an all-white orchestra in a mainstream Broadway production. Lee had been concertmaster of the show since opening night, and he became conductor nine months into the run. The racial desegregation of performance on New York’s stages gained traction as the Civil Rights Movement grew more effective in the 1950s and 1960s. Yet the advances were never completely game-changing, as has been the case in the culture at large. To its credit, however, the first production of On the Town yielded a site of opportunity, and many of its performers of color went on to distinguished careers in the theater and concert hall. Featured image credit: ‘Light beams in the England Sky’ by Paul Green. CCO via Unsplash. Carol J. Oja is William Powell Mason Professor of Music and American Studies at Harvard University. She is author of Bernstein Meets Broadway: Collaborative Art in a Time of War and Making Music Modern: New York in the 1920s (2000), winner of the Irving Lowens Book Award from the Society for American Music.